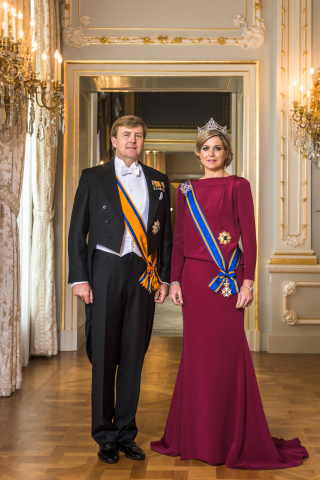 LANSING, Mich.--(BUSINESS WIRE)--His Majesty King Willem-Alexander and Her Majesty Queen Máxima of the Kingdom of the Netherlands will travel to Grand Rapids, Mich., on June 2, 2015, to celebrate the continuing bond between the Netherlands and Michigan. The trip is part of a three-day official visit to the United States to celebrate the strong economic ties between the two countries. Michigan Gov. Rick Snyder and First Lady Sue Snyder will host the Royal couple during their visit. It is the first time the Royal Couple will travel to the United States since His Majesty King Willem-Alexander succeeded his mother, Queen Beatrix (now known as Princess Beatrix), to become King in 2013. While the King and Queen are visiting the United States, an economic delegation to the U.S. will also occur. The Royal Couple will feel right at home when they arrive in West Michigan, where many family and street names reflect the Dutch pioneers who settled there. Michigan has the largest Dutch-American population in the nation (481,000). There are more than 4.5 million people of Dutch ancestry in the United States. The King and Queen and Governor will visit Frederik Meijer Gardens and Sculpture Park in Grand Rapids. The park carries the name of its benefactor, a second-generation Dutch immigrant to the United States who became a successful businessman with the Meijer stores. The gardens and sculpture park is a powerful symbol of the strong Dutch-American heritage in West Michigan, and a great location to celebrate that heritage and the ever-stronger economic links between the Netherlands and Michigan. The Royal Couple will enjoy a lunch at the park, with the King and Governor offering remarks. In honor of volunteers around the world, the King will plant a sugar maple tree in the volunteer garden. There is a shared interest between the Netherlands and Michigan on the importance of volunteering and philanthropy. The King’s grandmother —Queen Juliana 1952— and mother —Queen Beatrix 1982— both planted trees during their visits to Holland and Zeeland. The cities of Holland, Grand Rapids, and Zeeland will offer the King and Queen a cultural program at the Meijer Gardens. The Royal Couple together with the Governor will then visit Spectrum Health Helen DeVos Children’s Hospital and Van Andel Research Institute on the “Medical Mile” in Grand Rapids. They will see firsthand how generosity, community involvement and commitment of Dutch-American families such as the Van Andels, DeVoses and Meijers have built state-of-the-art research, care and educational facilities in Grand Rapids. As the largest children’s hospital in West Michigan, Spectrum Health Helen DeVos Children’s Hospital has been ranked in U.S. News & World Report as one of the Best Children’s Hospitals for three years in the specialties of nephrology and cancer. While at Helen DeVos Children’s Hospital, the King and Queen will visit with members of the oncology care team, patients and parents. Both the Netherlands and Grand Rapids are leaders in life sciences and health research (in areas such as oncology, epigenetics, regenerative medicine and Parkinson’s disease) as well as in combining research, patient care and community engagement. The King and Queen will leave Grand Rapids and travel to Chicago. The Netherlands and the United States are bound by a more than 400-year relationship grounded in a commitment to freedom, justice, and entrepreneurship. While in the US, the King and Queen will celebrate the strong economic, cultural and political ties between the two nations. The Netherlands is a fixture in the top five of foreign countries investing in the United States and the U.S. is the leading single-country investor overall for the Netherlands. The Dutch and American economic relationship supports 685,000 American jobs. Exports from the state of Michigan to the Netherlands adds to $332 million in goods and services. “The visit of His Majesty King Willem-Alexander and Her Majesty Queen Máxima will underline the deep bond that exists between the Netherlands and the United States. It will be my pleasure to show them all aspects of this special relationship, from our economic ties to our joint heritage,” said Rudolf Bekink, the Dutch ambassador to the United States. Deadline for credentialing is MAY 26, 2015. For additional information on the program of the Royal Visit please contact the Netherlands Embassy in Washington, Jacquelien.nienhuis@minbuza.nl, 202-274-2606 or (c) 202-262-0995 or ilse-van.overveld@minbuza.nl, 202-274-2630 or (c) 202-413-5020.